Having someone completely understand and deliver the brief for a no mush, tongue and cheek ceremony with such calm confidence was a dream. Top marks for speedy communication, assistance with all the official paperwork, friendly banter and of course totally looking the part in the dapper outfit. The best part of all was the way Ben seemed to just understand us. 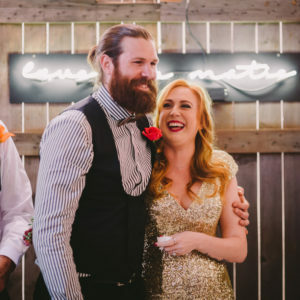 The personalised ceremony, that captured the very essence of our personalities – loving with a cheeky side note, blew not only Mario and I away, but all our guests too. Many of our guests have approached us post the ceremony to tell us how they cried or laughed at certain parts of the ceremony and to comment on what an outstanding job Ben did. Some people even asked us if Ben had known us for years! Ben provides that amazing balance between professional and personal. I can’t recommend Ben highly enough. We are so lucky to have found him! We didn’t have to think very hard about choosing Ben as our celebrant. We’d been lucky enough to witness his superb blend of humour, sentiment and professionalism first hand at a close family wedding, so we had no doubt that he was the man for the job. As most people will know when planning a wedding, the less you have to worry about, the better. From the very first meeting with Ben we already felt that the ceremony had been taken care of. He has a particularly amazing way of making it all seem very easy and immediately put our minds at rest. Our wedding day was without a doubt the best day of our lives, and Ben played a huge part in that. Again bringing his perfected blend of ceremony and comedy, he made our moment in the limelight shine even brighter. With a few questions to us prior to the wedding, he had crafted a service that was not only personal to us, but to those around us baring witness to our big day. In short, he’s a bloody nice guy, who does a bloody good job. We don’t think you can ask for much more in all honesty, and we could not of been happier with the role he played for us in our beautiful wedding. We’re so happy that we found you. You really made our ceremony memorable, unique, and so incredibly us. I’ve never been to a wedding that deserved compliments for their celebrant, they’re always middle aged women in outdated skirt suits that use the same drab, sensible ceremony template for each couple. You captured our personalities perfectly and had the right mix of humour and sentiment. All of my guests were raving about the “well dressed man”, especially the hat! The word dapper was thrown around a lot too. Thank you, a thousand times, thank you! Ben, we cannot thank you enough! It was a truly memorable day and would not have been the same without you! Your unique and special ceremony could not have been better. You captured who we are as individuals and a couple and left us all wanting to hear more…including myself and my now husband! What would you tell us all next! All the guests thought you were fantastic and they hadn’t enjoyed a ceremony so much ever before! If I was to do it all again (same man of course) there would be no thought other than choosing you! If we ever have a vow renewal you’ll be my first port of call. Yes there’s a lot of exclamations in this review but that’s because I need to express how amazing you really are! There was no awkwardness (as can be sometimes experienced) or judgement, just warmth, thoughtfulness and interest. Instantly disarming the nerves in our first meeting and on the day. Nothing was a bother or too much hassle. 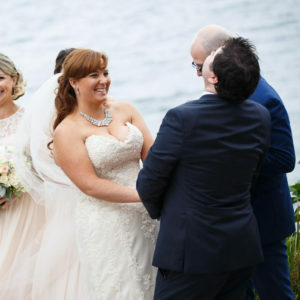 You cannot find a better celebrant in Sydney and you won’t regret choosing Ben for your wedding. 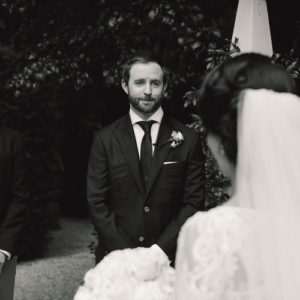 Ben was our celebrant last year in November! What can I say- such a lovely, talented, easy going man. As we all know weddings are stressful. So many things went wrong for me but Ben was seamless. From how well he understood us as a couple, to writing our ceremony, to his delivery of the ceremony. He made me feel calm from the second we met until the second I said I do! I couldn’t recommend anyone more. Out of all the vendors I dealt with, Ben was by far the easiest, best value, funniest and most professional! Stop calling this number. I’ve already told you, you weren’t my celebrant and I’m not even married!